Awesome job, mate. Well done! How does it perform on that test pattern I posted yesterday? 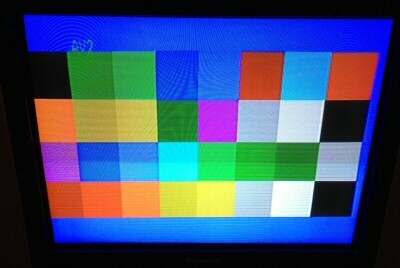 The full test pattern actually looks pretty good on my standard composite output (29" CRT TV). Composite seems to do ok with large blocks of colour (apart from the SC-3000 colour fade issue and the fact that I have the colour levels boosted *through the roof* on my TV). But where it always struggles is where you mix small blocks of colour with a different background, and the Text page tests show that up real well. Here are a couple of shots off a real SC-3000 with composite output to a 29" Panasonic CRT. You can see how some of the text almost disappears with the blue background. You get a lot of that with different colour combinations as the test progresses. (Note - the Moire pattern in the photos is just my iPhone struggling with the lighting and sync rate on the CRT - it isn't there in real life). Last edited by honestbob on Thu Mar 21, 2013 7:51 am, edited 1 time in total. Hmmm yeah I've always assumed that that nasty colour-vs-colour fuzzy banding effect was due to shonky PAL colour burst. No colour burst on component, so I don't expect to see any nasty effect. Haven't loaded anything into my Sega yet, will find some 3.5 mm leads, and playback your WAV files soon! One thing I have noticed, and I am FUSSY, is about every 8th pixel there is a very faint vertical line effect. This might be due to power drop at the VDP (or caused by one of the VRAM chips), so will try adding smoothing caps and see if can reduce. Can only notice on plain background. Re: 4:3, will have a try tonight and get snapshot. I just tried to reproduce natshaw's initial test with connecting pin 3 of daughterboard connector to a 470ohm resistor to ground then across to the green (Y) input on my 29" Panasonic CRT TV. No picture. I don't have another convenient test TV unless I shift everything up into the family room so I guess I'll have to wait for the op-amps to arrive to test further. honestbob wrote: I just tried to reproduce natshaw's initial test with connecting pin 3 of daughterboard connector to a 470ohm resistor to ground then across to the green (Y) input on my 29" Panasonic CRT TV. No picture. I don't have another convenient test TV unless I shift everything up into the family room so I guess I'll have to wait for the op-amps to arrive to test further. Ah, you might have reproduced blowing up the VDP there. Resistor must go from pin 3 to your RCA lead directly. Don't connect it to ground, otherwise you're got 2 loads in parallel, one of which is only 75 ohms, then VDP will probably die. Yes, I figured that out after the initial test when I double-checked the resistor value and got a shock that it was reading about 65 ohms. It took me a while to figure out that the TV gave me a 75 ohm resistance in parallel across that resistor. I guess the 470ohms to ground recommendation from the datasheet relies on having something like an op-amp with massive input impedance between you and the output, or if you are using AC coupling or similar. Luckily I haven't blown the vdp, but still no picture as yet on that TV. I picked up some potentiometers / trimpots from Jaycar, plus a header connector. The pins are a bit long, but JayCar HM3428 is a 8 pin right angle header connector that fits that daughterboard plug, more or less. I'll probably leave it now until the op-amps arrive. honestbob wrote: :) Yes, I figured that out after the initial test when I double-checked the resistor value and got a shock that it was reading about 65 ohms. It took me a while to figure out that the TV gave me a 75 ohm resistance in parallel across that resistor. I guess the 470ohms to ground recommendation from the datasheet relies on having something like an op-amp with massive input impedance between you and the output, or if you are using AC coupling or similar. Yeah agree, since next stage is part of the load, any resistor in parallel should be only for reducing a high-impedance load of the next stage, using R = 1/(1/470 - 1/NEXT), so anything over 10k next stage or so, you could use ~470, less than 10k next stage load, I'd do the sums. I'm avoiding the temptation to do AC coupling, I'm going to make a 2 x transistor-based non-inverting voltage gain amp, salvaged parts from a PAL daughterboard. Will be more work than the op-amp, but 2 differing approaches would be good. (Edited the above as I couldn't understand my own drivel, I must slow down when typing stuff). The Op Amps and THS7314 SDTV video amps arrived a couple of days back. I got it up and running tonight with a THS7314. This is a nice little 6dB (ie. 2 times) video amp with a built in filter for SDTV frequencies and you can pass three channels through it. First up - my TV will display component video directly off the TMS9929A outputs (with a 470 ohm resistor in series with each of the Y / Pb / Pr lines). The issue was that my TV won't display anything unless there are signals at all three component inputs. The image was a bit blueish and quite dark though. So I hooked up the THS7314 with a 500 Ohm trimpot to ground for each of Y / Pb / Pr and the input to the THS7314 taken from the wiper of the trimpot. The output goes through 75 ohm resistors to the TV component inputs. That works quite nicely, but as 5-11under noted for the Colecovision, everything either has a blueish tinge or you can't get the yellows / whites right. You can't get the colour balance right on all the colours. The test pattern program I wrote is very useful for adjusting that, but you really notice it most in games where things just don't look quite right. However what I will say is that the colour contrast is much better and I think the colour bleeding is reduced over the standard composite video output. I've been able to see detail in games with difficult colour combinations far more easily than before. But either I end up with a blueish tinge on everything (especially yellows / whites) or it all looks washed out if I try to get the yellows / whites correct again. So it looks like I'll have to try the second part of 5-11under's secret recipe - adding some Y back to the B-Y and R-Y channels. I'll post some photos of the breadboard setup tomorrow. Good work honestbob! Look forward to progress reports. I bought a CA3130 (higher b/w sibling of CA3140) from Jaycar yesterday, hooked it up (also as 2x gain), but am getting flat-line 1.4V output. Hmmm, not sure what's going on there, maybe my voltage divider (for gain) resistors are both too high. Will lower both down and see what I get. 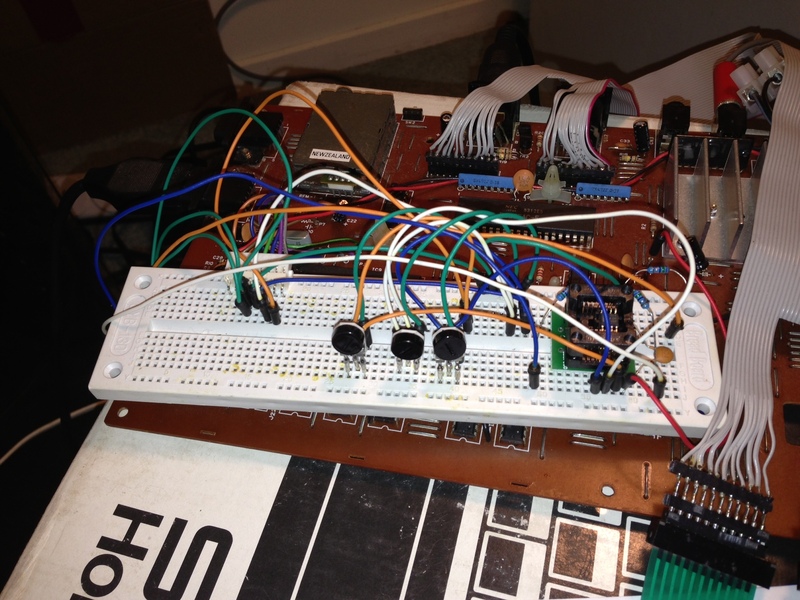 Here are a couple of photos of the breadboard setup. It is a bit hard to tell from the photos, but at the left of the breadboard I have an 8 pin header block attached to the SC-3000's video daughterboard connector. Pin 4 & 5 supply the ground feed to the breadboard. Pin 1 is R-Y, pin 2 is B-Y, pin 3 is Y. The THS7314 has 5v maximum supply, so I soldered a 5v feed onto a jumper cable on the motherboard rather than using the 9v feed from the header block. The THS7314 is in a SOIC socket to the right of the breadboard. The three 500 ohm trim pots are at the front / center of the breadboard. Note - one point of interest. I think I'm going to have to compare the component video to MESS as well as the original composite feed as I suspect the 'correct' colour balance is quite different to what I grew up with. 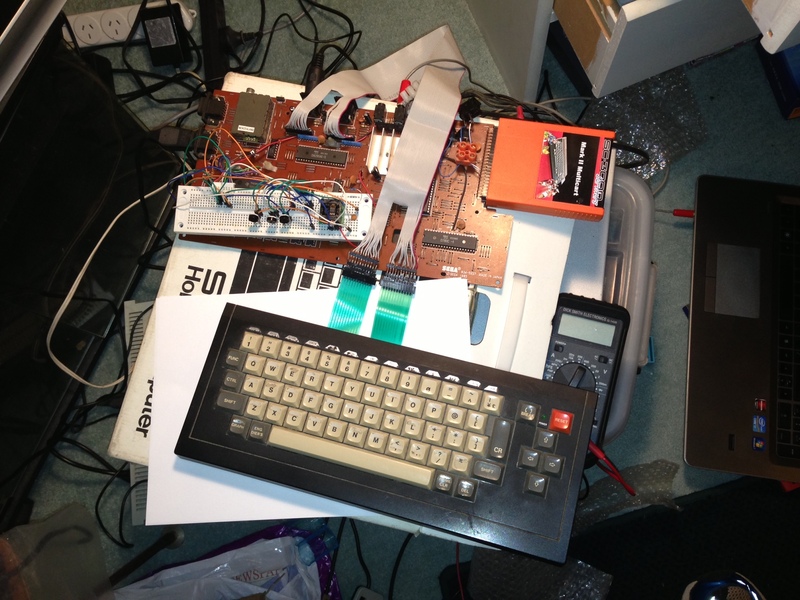 The MESS emulation I've looked at looks quite a bit like the component video tests I did last night. The reds actually seem a lot darker / pinker than I'm used to and the yellows are a much darker yellow rather than bright / light yellow going towards white. That is consistent with MESS, but doesn't necessarily enhance the visual experience as some of the colours seem to clash quite badly now (eg. I never liked the MESS rendering of Champion Boxing or Bank Panic as the 'correct' yellows and reds don't give very nice skin tones, but that actually looks quite a lot like what I saw last night on my component video test). I'll post a couple of examples of what I mean as I make progress. Anyway - back to the breadboard photos. I bought a CA3130 (higher b/w sibling of CA3140) from Jaycar yesterday, hooked it up (also as 2x gain), but am getting flat-line 1.4V output. Hmmm, not sure what's going on there, maybe my voltage divider (for gain) resistors are both too high. Will lower both down and see what I get. I'll send over a couple of the spare components I'm using to see if that helps with your testing. It would be handy to be able to run a scope over the output from my circuit and see what it looks like. Good stuff. I'll have a look at the Yeno daughterboard and try to figure out the RGB mix. There is much discussion on this topic on the Net, the % weightings only had to be understood/compensated for by the next stage, so they are (as I understand) differerent from the % weightings that the YPbPr standard uses. I've got scopes we can use, will PM you. I updated the multicart menu system to include the test pattern program last night to save me having to load it from tape. That is convenient so I can quickly jump between the test pattern and multiple different games to look at the colour balance after tweaking. Definitely too blue, but it is surprising how quickly you can get used to something. Once I actually spent 30 mins or so playing the games it wasn't too bad. I really like the higher definition in the games, although it does accentuate the pixelation of the sprites (composite gives a slightly more anti-aliased effect due to more colour bleed / less colour contrast, I think). Would be good to get the colour balance just right though. I also bought one of those 'brand new' boxed Yenos from Aussie - that arrived yesterday. It almost looks too good to open. Almost I'm interested to see how the RGB output compares to composite. There is a TV with a SCART connector at my parents place, so I'll borrow that. Natshaw - I found your address again this morning so I'll pop those chips in the post for you today. 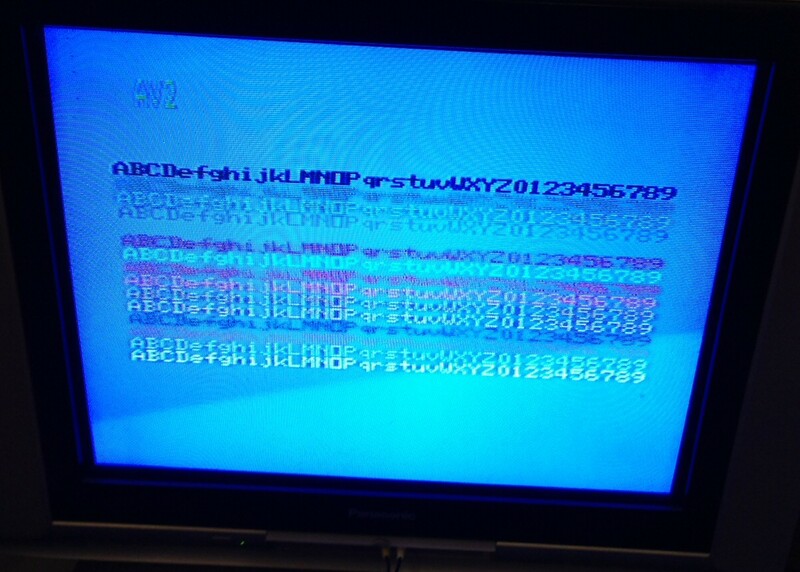 honestbob wrote: There is a TV with a SCART connector at my parents place, so I'll borrow that. Hope it's SCART with RGB! Have had SCART before that doesn't implement full spec, or does odd stuff like using component in via the RGB pins etc. If you wire up those voltage signals onto SCART also, you'll get auto-input selection if the TV supports it. natshaw wrote: Hope it's SCART with RGB! 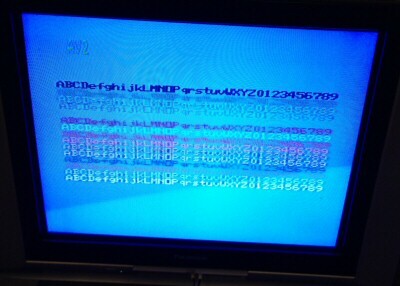 Have had SCART before that doesn't implement full spec, or does odd stuff like using component in via the RGB pins etc. 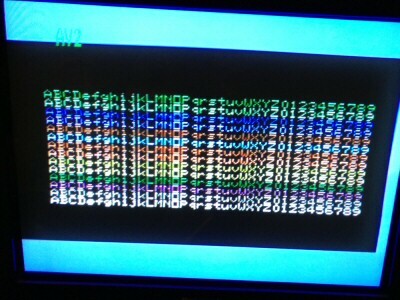 If you wire up those voltage signals onto SCART also, you'll get auto-input selection if the TV supports it. Ta - I'll let you know once I've had time to pick it up and have a play. Progress update and some notes for future reference. These are the measured resistance levels at the trim pots feeding from the TMS9929A daughterboard connector to the THS7314 buffer amplifier after I adjusted them on my test pattern to get a reasonable balance. The trim pots basically form a voltage divider which scale the output from the TMS9929A. Note that the trim pot resistance levels can vary quite a bit, but I don't think that is critical for this application. As expected (from 5-11under's work), we have to scale B-Y back by more than R-Y and Y to get rid of the overly blue default picture. And as expected, I'm getting washed out yellows. So I tried using the AD830 to subtract some Y from the scaled B-Y signal. In 5-11under's notes he says to adjust B-Y, then R-Y and Y to suit, then try adjusting the -Y pot. You should be able to see more saturated yellows before the white starts yellowing out. But in my setup the white starts to go to green at the same time the Yellows start to saturate more. So something isn't quite right there. I haven't tried the -Y correction to the R-Y yet, but that should be minimal as that is scaled to approximately the same level as Y from my measurements above. I hooked the AD830 in by powering it off the 9v feed from the daughterboard connector (you need 8v minimum if using a single supply, so 9v is fine). The amplified Y signal is fed to a trim pot to ground with the wiper connection going to pin 2 of the AD830. The amplified B-Y signal goes to the AD830, then I'm driving the Pb line to the TV from the AD830 output. (check the datasheet for rest of wiring - you loop the output from pin 7 back to pin 4 and wire pin 3 to ground). I also have an original component video output SC-3000 hooked up to the same TV with a multicart so I can quickly switch between the before / after views to see how well my mod compares. So far, the component video gives better resolution, and better performance on allowing colours to stay seperated (composite fails miserably when you have small areas of reds and yellows / whites together on black for instance, and some other colour combinations are bad too). But I can't match the nice bright well balanced test pattern I can get on the original composite feed yet, so still some work to do. Having said that, my composite view has the TV colour boosted up to maximum and component is only at 50%, but the difference in the yellows and whites is still very noticeable on the large colour blocks in the test pattern and much better on the original composite feed). Last edited by honestbob on Mon Apr 15, 2013 9:10 am, edited 1 time in total. Hmmm... just thinking about what natshaw said earlier in the thread. natshaw wrote: Pin 3 of daughterboard, to a 470 ohm resistor, to green (luminance + sync) socket on component video (DVD) input. This gives about correct impedance for the VDP chip to drive. However, signal is not 1 V p-p, it's more like 0.25 V. Quality device like Sony TV can just understand signal. Dell monitor with component inputs cannot. Also I agree with his earlier comments about the image being dark when just running through a 470 Ohm resistor in series to the YPbPr cables. So I'm just wondering if my maths above on the voltage division is correct. ie. Maybe that fits with the TMS9929A datasheet too (page 5.3, figure 5-1). It says Vwhite can be from 2.5v to 3.6v and Vblack from 1.6v to 2.5v and Vsync from 1.2 to 2v. So maybe a large attenuation is required to get everything down into that 1v P-P range. Thoughts anyone? Last edited by honestbob on Mon Apr 15, 2013 9:11 am, edited 2 times in total. or 1.464? I've done a bit more working out of the RGB values implicit in the VDP's YPrPb tables in the datasheet. Starting to make sense now, will post details later today.